The electoral body has appealed to voters on the proper way to thumb print on the ballot paper while voting on election day. 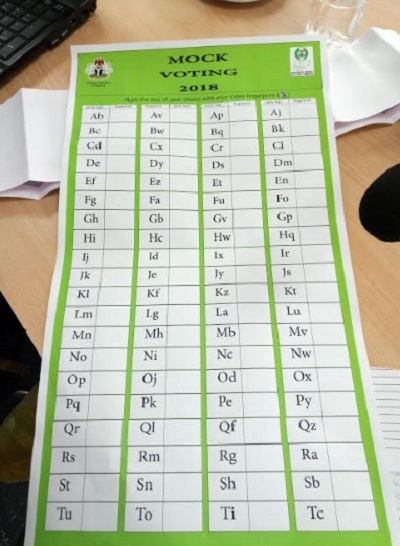 Ballot paper prototype produced by INEC containing the initial 68 political parties. The Independent National Electoral Commission (INEC) has urged voters to ensure that ink does not spill beyond the box meant for a party to another while marking the ballot papers when voting. The electoral body made this appeal while reacting to “false reports” that only the index finger is approved for marking the ballot papers. “INEC’s attention has been drawn to fake news making rounds that the index finger is the only finger approved for marking a ballot paper. This is false,” INEC said. It described the rumour as “false”, noting that “at the point of registration, all ten fingers were captured. So any finger can be used for marking a ballot paper.